The name of this country b&b is medieval, some think even Egyptian, in origin: The game of the goose. The beautiful winding path drawn out on the board is similar to that of snakes and ladders and represents the eternal circle of life. Located on the Barolo wine route, at the feet of the Cannubi hills and only 2kms from Barolo itself, the Gioco dell’Oca is an eighteenth century farm house, lovingly restored to its former glory by its owner, Rafaella, who inherited it from her grandparents. 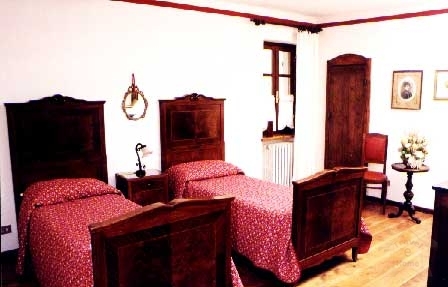 The bedrooms and breakfast room are furnished with traditional furniture and are particularly cosy and comfortable. Only 10 kilometres from Alba, the Gioco dell’Oca makes an ideal base from which to explore the delights of the Langhe and guests may, if they feel inclined, make use of a rich library of information on the area that Raffaella has collected. She has also put together many interesting local itineraries, including visits to quaint villages and castles, wine museums and vineyards. Accomodation comprises 6 bedrooms with ensuite bathrooms, and one mini-apartment with cooking area for longer stays.